Progonyleptoidellus striatus, copyright Jan van Bodegraven. The Progonyleptoidellinae are a group of gonyleptid harvestmen with the fourth coxa hidden in dorsal view, and the pedipalp long and slender. Characters (from Soares & Soares 1985): Coxa IV (in dorsal view) with the apex only visible outside the dorsal shield, or, if visible to a greater degree, with the visible section very narrow. Dorsal scutum with four sulci, areas I and II joined or not by median longitudinal sulcus. Eyes set in a common ocularium. Palps slightly longer than the body, femur cylindrical and slender or somewhat thick and compressed, unarmed or with an internal apical spine. Tarsi with large numbers of segments, tarsus III with at least three segments more than tarsus I (usually with about twice as many segments as tarsus I), rarely with one or two more segments, tarsus I with more than 6 segments, or, if with six, with three segments less than tarsus III. Distitarsus II with four segments. Tarsus III and IV with pseudonychium, with two smooth claws, without scopula or with rudimentary scopula. Soares, H. E. M., & B. A. M. Soares. 1985. Opera Opiliologica Varia XXII. 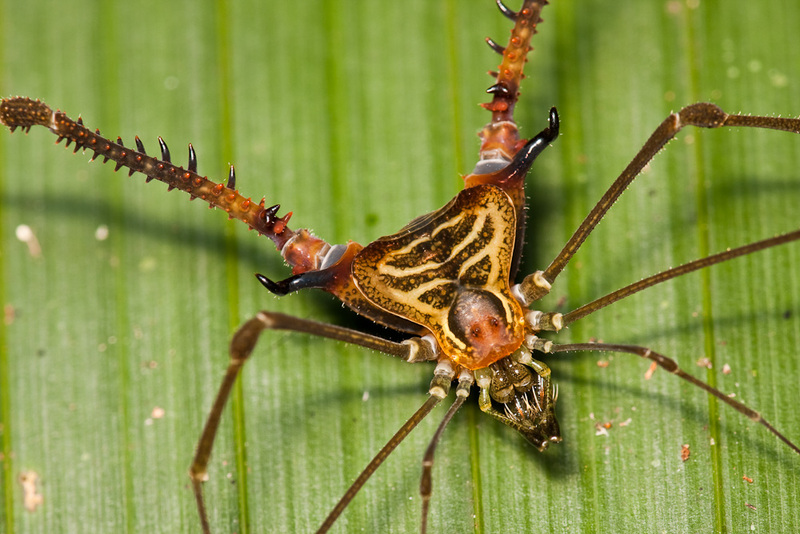 Opiliones Gonyleptidae. Naturalia 10: 157–200.